But mingled with these anthems to national elation another sound is borne to us—insistence. 1. E.D. Morel was a British journalist who sought to expose what he felt were the injustices of imperialism. 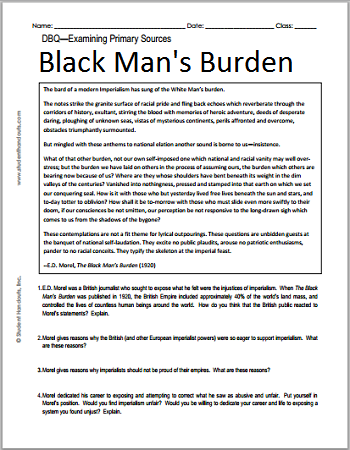 When The Black Man's Burden was published in 1920, the British Empire included approximately 40% of the world's land mass, and controlled the lives of countless human beings around the world. How do you think that the British public reacted to Morel's statements? Explain. 2. Morel gives reasons why the British (and other European imperialist powers) were so eager to support imperialism. What are these reasons? 3. Morel gives reasons why imperialists should not be proud of their empires. What are these reasons? 4. Morel dedicated his career to exposing and attempting to correct what he saw as abusive and unfair. Put yourself in Morel's position. Would you find imperialism unfair? Would you be willing to dedicate your career and life to exposing a system you found unjust? Explain.